Molly Harper's sister had been killed—and her baby niece had been kidnapped. Now, the only man she could depend on to help her solve the crime—and bring Baby Kate to safety—was Thomas Lakewood. I always loved the Harlequin Intrigue line. The “Fear Familiar” series was one of the first I used to follow. 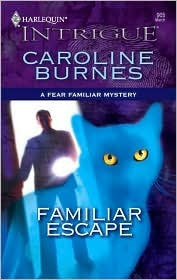 Familiar Escape is the 20th book in the series. It’s been awhile since I read #19, but I saw my library had it as an e-book and I couldn’t resist. I, also, noticed the author is re-releasing the series. I knew I had to go back to it and I’m so glad I did. It was like re-visiting an old friend. Besides Familiar, there are other characters in the book. LOL Our main characters are Molly and Thomas. Things start off rocky since Thomas has been arrested for murdering Molly’s sister, but – with some convincing from Familiar, Molly believes he’s innocent. They team up to not only clear Thomas’ name, but to find Molly’s infant niece who disappeared after Molly’s sister is murdered. The police have already written baby Kate off as being murdered as well. Molly isn’t buying it since no body has been found. As their investigation progresses, Molly and Thomas don’t know who they can trust except each other and Familiar. It doesn’t take long for the couple to grow closer and closer. The story is heavy on the mystery with a little romance thrown in – just the way I like it. This was a very quick read for me. It’s well-written and the characters come to life on each page. I’m looking forward to catching up with Familiar in his next adventure. I borrowed this from my library. I was not required to write a positive review. All opinions expressed are my own. I'm not sure I've read any Harlequin Intrigue and definitely nothing in the Familiar series but this sounds fun! I love that the cat is a regular cat who happens to solve crimes and I like my romantic suspense heavy on the mystery as well. I'll have to check this one out! Familiar is based on my own cat, E.A. Poe, who could communicate his disdain of humans very well. FEAR FAMILIAR is reissued for .99 cents in digital, and TOO FAMILIAR will be out for .99 cents in May. I hope you like the stories. I definitely have not read a series where a cat is one of the main characters!! Sounds interesting. Yvonne, I'm glad you enjoyed reading this cat-driven mystery. It sounds like a very cute cat cozy. Love that the cat is a main character, but at #20, I don't think I want to start the series. I'm reissuing the first books. FEAR FAMILIAR is out now at Amazon.com for only .99 cents. TOO FAMILIAR will release in May, also for .99. These are the first two in the Familiar series, but I'm going to start a brand new series in July with Trouble, son of Familiar. While Familiar believes he's a Humphrey Bogart kind of cat, Trouble patterns himself after Sherlock Holmes, as played by Benedict Cumberbatch. It's a ton of fun for the writers! And I hope the readers.